If you read Genesis 1 and believe from Genesis 1 that the world was created in six days, I applaud you. That is a profound thing to believe in simplicity of faith. However, if you wish to persuade me that Orthodox Christians should best believe in a young earth creation in six days, I am wary. Every single time an Orthodox Christian has tried to convince me that I should believe in a six day creation, I have been given recycled Protestant arguments, and for the moment the entire conversation has seemed like I was talking with a Protestant fundamentalist dressed up in Orthodox clothing. And if the other person claims to understand scientific data better than scientists who believe an old earth, and show that the scientific data instead support a young earth, this is a major red flag. Now at least some Orthodox heirarchs have refused to decide for the faithful under their care what the faithful may believe: the faithful may be expected to believe God’s hand was at work, but between young earth creationism, old earth creationism, and “God created life through evolution”, or any other options, the heirarchs do not intervene. 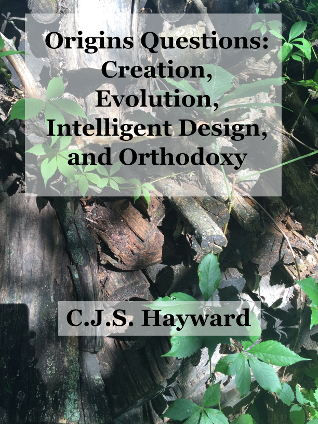 I am an old earth creationist; I came to my present beliefs on “How did different life forms appear?” before becoming Orthodox, and I have called them into a question a few times but not yet found reason to revise them, either into young earth creation or theistic evolution. I would characterize my beliefs, after being reconsidered, as “not changed”, and not “decisively confirmed”: what I would suggest has improved in my beliefs is that I have become less interested in some Western fascinations, such as getting right the details of how the world was created, moving instead to what might be called “mystical theology” or “practical theology”, and walking the Orthodox Way. There is something that concerns me about Orthodox arguing young earth creationism like a Protestant fundamentalist. Is it that I think they are wrong about how the world came to be? That is not the point. If they are wrong about that, they are wrong in the company of excellent saints. If they merely hold another position in a dispute, that is one thing, but bringing Protestant fundamentalism into the Orthodox Church reaches beyond one position in a dispute. Perhaps I shouldn’t be talking because I reached my present position before entering the Orthodox Church; or rather I haven’t exactly reversed my position but de-emphasized it and woken up to the fact that there are bigger things out there. But I am concerned when I’m talking with an Orthodox Christian, and every single time someone tries to convince me of a young earth creationism, all of the sudden it seems like I’m not dealing with an Orthodox Christian any more, but with a Protestant fundamentalist who always includes arguments that came from Protestant fundamentalism. And what concerns me is an issue of practical theology. Believing in a six day creation is one thing. Believing in a six day creation like a Protestant fundamentalist is another matter entirely. In reading the Fathers, one encounters claims of a young earth. However, often (if not always) the claim is one among many disputes with Greek philosophers or what have you. To my knowledge there is no patristic text in which a young earth is the central claim, let alone even approach being “the article by which the Church stands or falls” (if I may borrow phrasing from Protestant fundamentalist cultural baggage). But, you may say, Genesis 1 and some important Fathers said six days, literally. True enough, but may ask a counterquestion? Are we obligated to believe that our bodies are composed of earth, air, fire and water, and not of molecules and atoms including carbon, hydrogen, and oxygen? Others imagined that atoms, and indivisible bodies, molecules and bonds, form, by their union, the nature of the visible world. Atoms reuniting or separating, produce births and deaths and the most durable bodies only owe their consistency to the strength of their mutual adhesion: a true spider’s web woven by these writers who give to heaven, to earth, and to sea so weak an origin and so little consistency! It is because they knew not how to say “In the beginning God created the heaven and the earth.” Deceived by their inherent atheism it appeared to them that nothing governed or ruled the universe, and that was all was given up to chance. “And the Spirit of God was borne upon the face of the waters.” Does this spirit mean the diffusion of air? The sacred writer wishes to enumerate to you the elements of the world, to tell you that God created the heavens, the earth, water, and air and that the last was now diffused and in motion; or rather, that which is truer and confirmed by the authority of the ancients, by the Spirit of God, he means the Holy Spirit. St. Basil rejected atoms and molecules, and believed in elements, not of carbon or hydrogen, but of earth, air, fire, and water. The basic belief is one Orthodoxy understands, and there are sporadic references in liturgical services to the four elements of earth, air, fire, and water, and so far as I know no references to modern chemistry. St. Basil seems clearly enough to endorse a six day creation, and likewise endorses an ancient view of elements while rejecting belief in atoms and molecules as implicit atheism. Why then do Orthodox who were once Protestant fundamentalists dig their heels in at a literal six day creation and make no expectation that we dismiss chemistry to believe the elements are earth, air, fire, water, and possibly aether? The answer, so far as I can tell, has nothing whatsoever to do with Orthodoxy or any Orthodox Christians. It has to do with a line in the sand chosen by Protestants, the same line in the sand described in Why Young Earthers Aren’t Completely Crazy, a line in the sand that is understandable and was an attempt to address quite serious concerns, but still should not be imported from Protestant fundamentalism into Holy Orthodoxy. If you believe in a literal six day creation, it is not my specific wish to convince you to drop that belief. But I would have you drop fundamentalist Protestant “creation science” and its efforts to prove a young earth scientifically and show that it can interpret scientific findings better than the mainstream scientific community. And I would have you leave Western preoccupations behind. Perhaps you might believe St. Basil was right about six literal days. For that matter, you could believe he was right about rejecting atoms and molecules in favor of earth, air, fire, and water—or at least recognize that St. Basil makes other claims besides six literal days. But you might realize that really there are much more important things in the faith. Like how faith plays out in practice. The fundamentalist idea of conversion is like flipping a light switch: one moment, a room is dark, then in an instant it is full of light. The Orthodox understanding is of transformation: discovering Orthodoxy is the work of a lifetime, and perhaps once a year there is a “falling off a cliff” experience where you realize you’ve missed something big about Orthodoxy, and you need to grow in that newly discovered dimension. Orthodoxy is not just the ideas and enthusiasm we have when we first come into the Church; there are big things we could never dream of and big things we could never consider we needed to repent of. And I would rather pointedly suggest that if a new convert’s understanding of Orthodoxy is imperfect, much less of Orthodoxy can be understood from reading Protestant attacks on it. One of the basic lessons in Orthodoxy is that you understand Orthodoxy by walking the Orthodox Way, by attending the services and living a transformed life, and not by reading books. And if this goes for books written by Orthodox saints, it goes all the more for Protestant fundamentalist books attacking Orthodoxy. Science won’t save your soul, but science (like Orthodoxy) is something you understand by years of difficult work. Someone who has done that kind of work might be able to argue effectively that evolution does not account for the fossil record, let alone how the first organism could come to exist: but here I would recall The Abolition of Man: “It is Paul, the Pharisee, the man ‘perfect as touching the Law’ who learns where and how that Law was deficient.” Someone who has taken years of effort may rightly criticize evolution for its scientific merits. Someone who has just read fundamentalist Protestant attacks on evolution and tries to evangelize evolutionists and correct their scientific errors will be just as annoying to an atheist who believes in evolution, as a fundamentalist who comes to evangelize the unsaved Orthodox and “knows all about Orthodoxy” from polemical works written by other fundamentalists. I would rather pointedly suggest that if you care about secular evolutionists at all, pray for them, but don’t set out to untangle their backwards understanding of the science of it all. If you introduce yourself as someone who will straighten out their backwards ideas about science, all you may really end up accomplishing is to push them away.